Enjoy contemporary cottage styling in your bedroom with the Corliss Landing Panel Bed. Crafted from responsibly harvested solid Acacia, woodwork features a weathered, driftwood grey finish that brings a rustic look and feel to your master retreat. 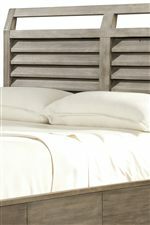 A shutter-inspired louvered headboard adds an eye-catching detail that is truly the heart of the bed's design. It also features a low profile footboard that brings the piece a casual, relaxed ambiance. Storage drawers in the rails offer convenient space to tuck away extra linens, blankets, and more. This bed is available in Queen and King sizes. 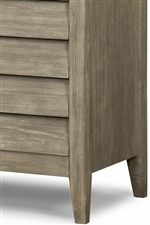 The Corliss Landing Queen Louvered Storage Low Profile Bed by Cresent Fine Furniture at AHFA in the area. Product availability may vary. Contact us for the most current availability on this product. 5632QRL Queen Single Rail 1 65" 87.3125"
5632QRS Queen Storage Rail w/ 2 Drawers 1 65" 87.3125"